Kollmanation Signature, Other guitar saturation effect from Jeff Kollman. Jeff Kollman worked with Tim Jauernig on the new Kollmanation overdrive and boost pedal, which retails directly on the artist's website. 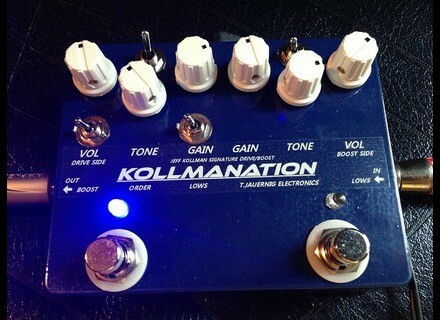 The Kollmanation is Kollman's first Signature pedal. The artist (Mogg/Way, Glenn Hughes...) wanted it to be versatile, so you can use the overdrive (on the left side of the pedal) and boost (on the right) together or separately, and can even switch their order in the signal path. The pedal features volume, gain and tone knobs for each effect section. The Kollmanation is available directly on Kollman's website for $229. Fishman updates its Triple Play system A few weeks after its release, Fishman offers the first update for its Triple Play wireless audio and MIDI system for guitar. Mad Professor unveils the Royal Blue Overdrive Mad Professor will launch in august a new overdrive pedal that can be easily recognized by its Royal Blue enclosure.